The Frist Center’s new exhibition, ‘Telling Tales: Stories and Legends in 19th-Century American Art’, looks at how moral and cultural narratives were painted into 19th-century American art, and subsequently shaped American taste. The show is an adaptation of the New-York Historical Society’s exhibition ‘Making American Taste’. We asked the Frist Center’s Chief Curator Mark Scala to tell us more about the show, and explain a little about how a touring exhibition such as this one can be tailored to its new location. Click here for a gallery of highlights from the exhibition. Could you tell us a bit about the theme of the exhibition? ‘Telling Tales’ contains works of art that use visual stories for the purpose of instruction, moral elevation, or social cohesion. Together, they constitute a broad narrative that explores American taste as a reflection of changes in the national experience and the perception of its defining ideals. The galleries are arranged thematically. 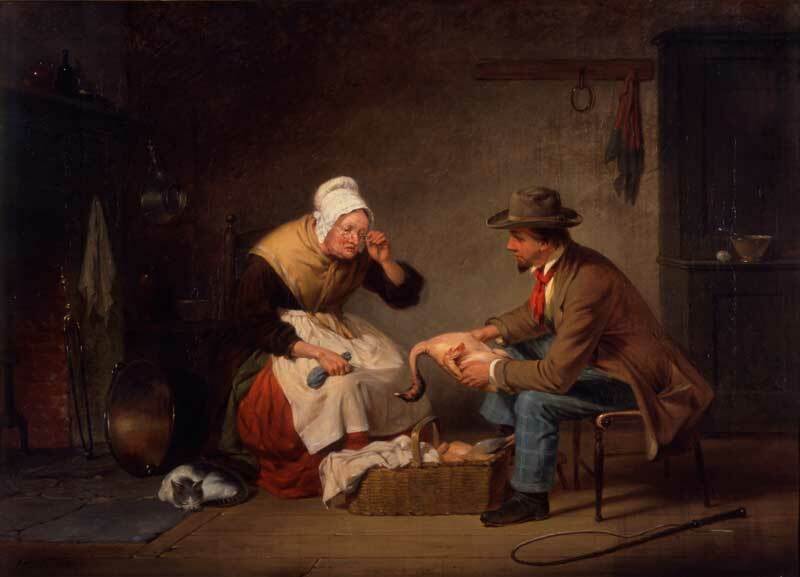 A selection of history-themed paintings, showing imaginative reconstructions of scenes from the Pilgrim era through the Civil War, demonstrates how art provided a common language that could unite audiences in a singular perception of its past. The deep connection that remained between the United States and Europe is the subject of a group of works devoted to the transmission of literary taste by depicting scenes from Shakespeare, Lord Byron, and others. This section also includes neoclassical paintings by Americans who sought to master the techniques and subject matter taught in Europe’s academies. When they returned to the United States, armed with antique allegories and a florid technical foundation, many of these artists received a lukewarm reception. The country’s preference for unembellished, straightforward narratives of everyday life is shown in a selection of genre scenes celebrating rural America, which is adjacent to a group of works that depict the difficulties faced by migrants and immigrants in America’s cities. The last part of the exhibition reveals the ambivalence some artists displayed toward addressing contradictions between America’s idealism and its oppressive treatment of people of colour. This section is not simply a gaze back at more benighted times, but a premonition of future, difficult conversations on acknowledging and remedying such injustice. This is an adaptation of the New-York Historical Society’s exhibition ‘Making American Taste’. What, besides the title, has changed? How closely did you work with Barbara Gallati and Linda Ferber, and how much licence did you have to interpret (or reinterpret) their work? It seems to me that the challenge facing Linda Ferber and Barbara Gallati when organising this exhibition – which is composed of works that have been acquired over many decades with no single point of view – was to construct a narrative that does justice to individual works and that conveys the character of the collection to best advantage. Yet to make a compelling thesis, they also had to devise a framework to help the audience see the collection anew; to explore less studied aspects of the period in question; and to identify technical and ideological patterns, habits of thought, and subliminal or unintended messages. Our curatorial team really responded to the New-York Historical Society’s fresh consideration of American art’s reception and impact. At the same time, we liked the alternative title, ‘Telling Tales: Stories and Legends in 19th-Century American Art’, because it broadens the discussion, expanding it from matters of connoisseurship, patronage, and class to larger stories relating to egalitarianism and education, social transformation and conflict, and idealism and reality. Still, the selection of works remains the same and the exhibition’s organisation is relatively unchanged. In adapting the wall texts and labels, we placed greater emphasis on the works’ narrative, symbolism, and didactic intent, as well as highlighting sociopolitical frameworks revealed through the embedded assumptions in each group of works. We want to provide visitors, especially school groups, with the tools to analyse both the overt and hidden content of art, a skill that will serve them well as they navigate their way through today’s forest of visual culture. ‘Telling Tales: Stories and Legends in 19th-Century American Art’ is at the Frist Center for the Visual Arts, Nashville, from 27 February–7 June. And will traditional art industry divides persist online?